Being in the Arizona deserts, these 4 basins have relatively few rainfall runoff events so calibration may take a few years... I'm kidding. And many of the largest runoffs come in winter with rainfall on snow in the upper elevations. Not sure how to deal with that. Lets see how it goes. All but the Burro Creek gage has a tipping bucket and daily rainfall accumulation comparisons for these gages are shown at the bottom of this page. 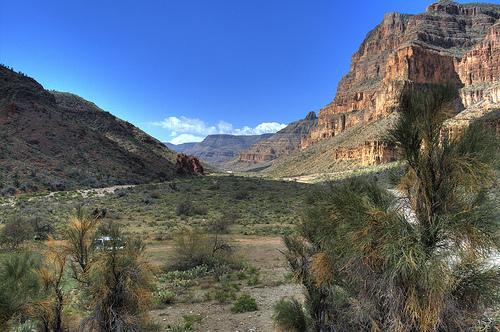 Diamond Creek flows into the Colorado River of the Grand Canyon above Lake Mead. 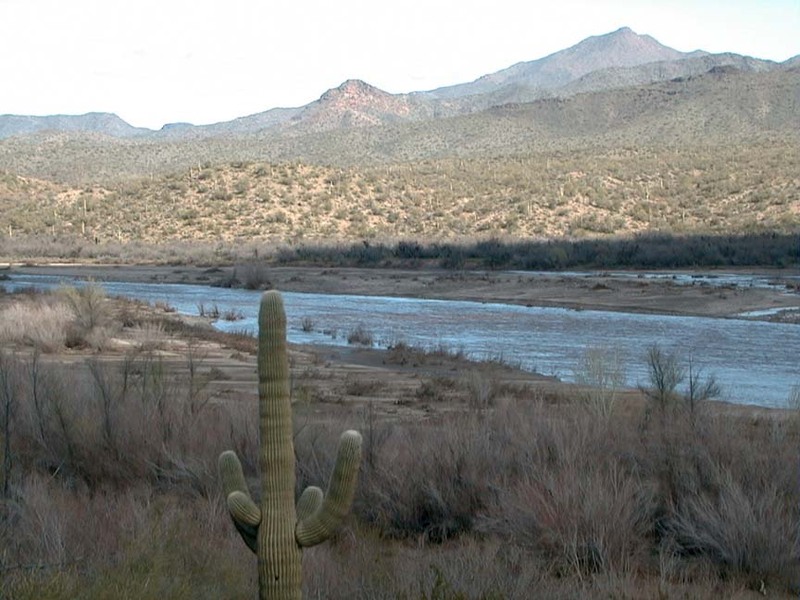 Big Sandy, Burro Creek, and Santa Maria combine above the COE's flood control at Alamo Lake to form the Bill Williams River that flows into Colorado River just above Paker Dam. These desert "rivers" and "creeks" can often be bone dry one minute and hell's fury the next and NEXRAD can tell you Why... or Nothing. ;) The results below come from continuous rainfall runoff modeling in real-time so once the model parameters are set in the GetRealtime.exe setup the real-time results are on their own until/if parameters are changed (initial loss, costant loss, % impervious, recession ratio). Only the initial loss is self adjusting. I know when winter comes radar overshoot will leave these basins high and dry with Nothing at these distances. So just cool your tamales and stop asking Why. 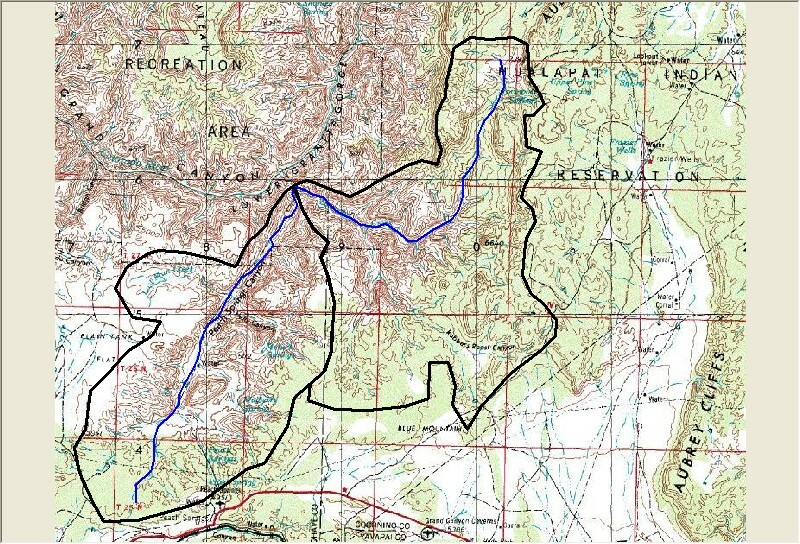 The Diamond Creek gage basin shown below was subdivided into the Peach Springs Canyon and Diamond Creek Canyon sub areas. For help in using GetMapArea and GetNexrad to set the basin boundary and point files go here for an example. The Peach Springs Canyon subarea centroid is 80 miles east of the ESX-Las Vegas radar and the Diamond Creek Canyon subarea centroid is 90 miles east of the ESX radar. A calibration was made on Peach Springs Canyon as shown below. Little rain fell on Diamond Creek Canyon which had only a few cfs runoff and made things simpler. Looks like the USGS gage was filling after the peak then cutting so runoff volume was not compared. These real-time values have been red lined by the USGS and will probably be recomputed after the peak. 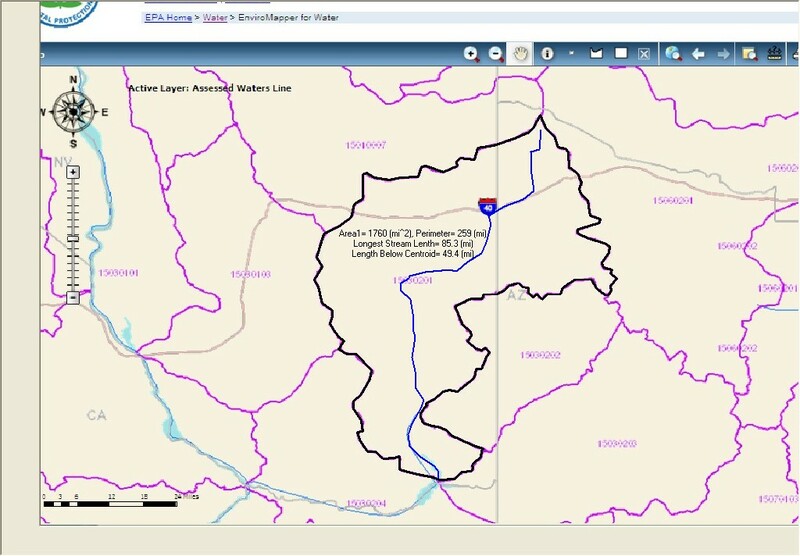 The Big Sandy River basin shown below was determined by cut and paste of the HUC by the EPA's Enviromapper into GetMapArea. For help in using GetMapArea and GetNexrad to set the basin boundary and point files go here for an example. Update: GetMapArea now has the USGS National Map Viewer in full screen with HUC's and is better than the Enviromapper or just about anything else. The basin area centroid is 95 miles southeast of the ESX-Las Vegas radar. The Big Sandy Gage is downstream of Burro Creek (see below) and the Daily Peak graph shows both the runoff from the Big Sandy basin combined with the Burro Creek runoff. 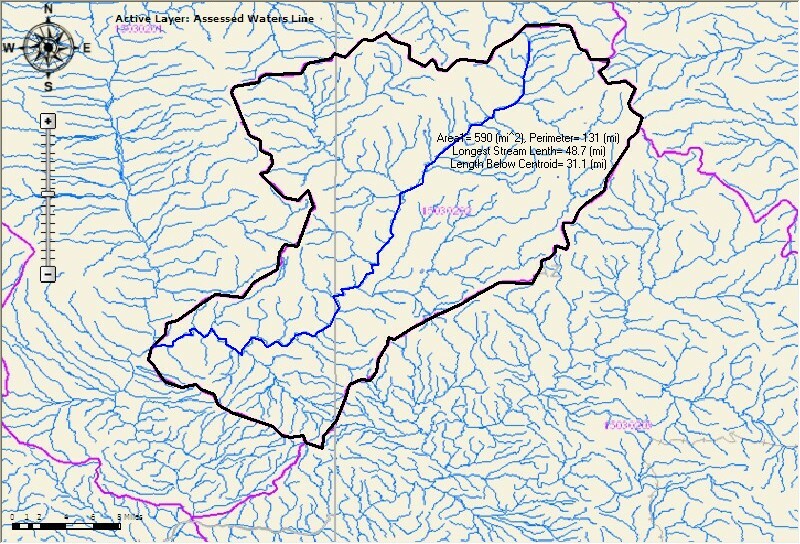 The Burro Creek gage basin shown below was determined by cut and paste of the HUC by the EPA's Enviromapper into GetMapArea. For help in using GetMapArea and GetNexrad to set the basin boundary and point files go here for an example. The basin area centroid is 115 miles southeast of the ESX-Las Vegas radar and 117 miles west of the FSX-Flagstaff radar and will have rainfall and runoff determined from both radars. A calibration was made on Burro Creek with the ESX-N0R rainfall as shown below. Looks like the upper reaches got saturated and oozed out some flow 32 hours after the peak rainfall. Not much of a peak in rainfall. 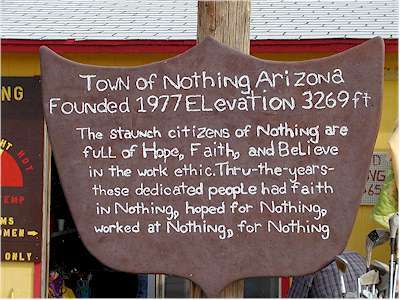 Well this is something to look at until something better comes along. I used a 24 hour lag as sort of a way to match the peak flow. The ESX and FSX radar daily basin average rainfall is shown below on the Daily Peak Flow graph. 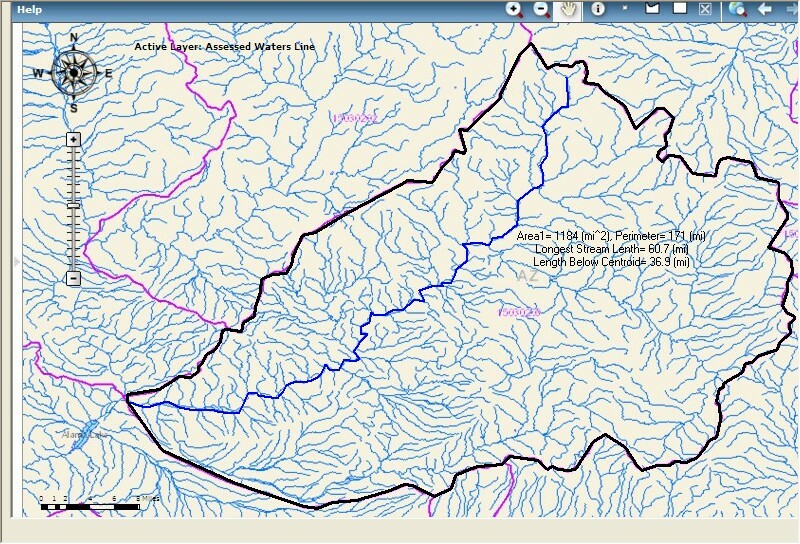 The Santa Maria gage basin shown below was determined by cut and paste of the HUC by the EPA's Enviromapper into GetMapArea. For help in using GetMapArea and GetNexrad to set the basin boundary and point files go here for an example. The basin area centroid is 109 miles northwest of the IWA-Phoenix radar and 103 miles west of the FSX-Flagstaff radar and will have rainfall and runoff determined from both radars. The standard Convective Z-R radar to rainfall relation was used Oct 1 - Nov 1, 2010 then West Cool Z-R to May 18, 2011. The standard Convective Z-R radar to rainfall relation was used Oct 1, 2010 to present. 1) USGS Diamond Creek rainfall gage. 2) Frazier Well Wundergage MFZWA3. 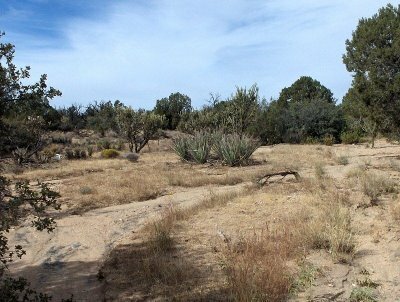 3) Sierra Verde Wundergage KAZSELIG1. The daily ratio was computed as the average of 3 gages divided by the average of the 3 radar points. 1) USGS Santa Maria rainfall gage. 2) Camp Wood Wundergage MCPWA3. 3) Goodwin Mesa Wundergage MQGDA3. USGS REMARKS.--Records fair except for low flows, which are poor. 1) USGS Big Sandy rainfall gage. 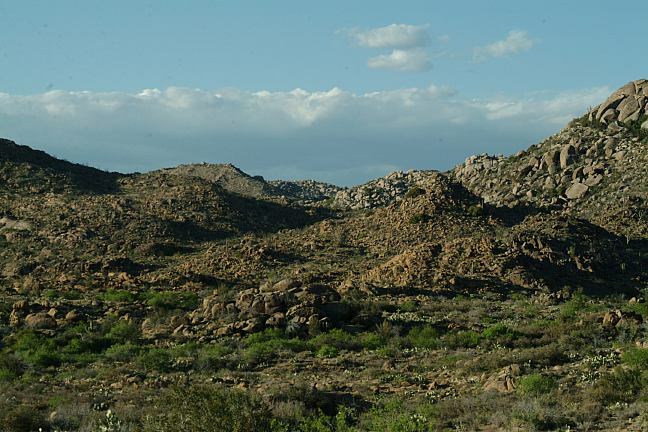 2) Sierra Verde Wundergage KAZSELIG1. USGS REMARKS.--Records fair due to unstable channel conditions. Diversions above station for irrigation of about 3,800 acres, mostly bypumping from ground water. USGS REMARKS.--Records fair except for estimated days, which are poor. Diversions above station for irrigation of about 5,300 acres, most of which is by pumping from ground water.